In the US during the silent period, four film adaptations of Henrik Ibsen’s play, A Doll’s House (Et dukkehjem) from 1879, were produced, all of which are considered to be lost films: a one-reel film produced by the Thanhouser Company in 1911; a 1917 production directed by Joseph De Grasse and starring Dorothy Phillips [fig. 1]; a 1918 film directed by Maurice Tourneur and starring Elsie Ferguson [fig. 2]; and finally the 1922 adaptation produced by and starring Alla Nazimova, and directed by Charles Bryant [fig. 3]. As all the films are lost, what is left are their discursive surroundings: the responses they elicited in (a limited group of) viewers, as suggested by film reviews and trade press articles, and also strategies chosen for advertising the film, as evidenced by promotional materials and publicity photos. This discursive material reveals how the gender politics of Ibsen’s play became explicitly linked to modernist notions of the female performer and the relationship between stage and screen. The film adaptations of Ibsen’s A Doll’s House are of particular interest in the history of women and the silent screen because they served as points of departure for discussions on how to represent modern womanhood and gender relations – both on narrative and thematic levels, and through the physical performances of each of the lead actresses. Figure 1 - Publicity photo for A Doll’s House (Joseph De Grasse, 1917). The Margaret Herrick Library, Los Angeles. Figure 2 - Publicity photo for A Doll’s House (Maurice Tourneur, 1918). The Margaret Herrick Library, Los Angeles. Figure 3 - Publicity photo for A Doll’s House (Charles Bryant, 1922). The Margaret Herrick Library, Los Angeles. During the 1910s and early 1920s, around 30 known Ibsen adaptations were made in a number of countries. Mostly adaptations of stage plays, these films often generated debates in reviews and articles on the differences between cinema, theatre, and literature. In trade press and film discourses of the 1910s, Ibsen was a recurring cultural reference, but also an ambivalent and paradoxical one. He is often mentioned as an important source of inspiration with regard to the aesthetic of realism, the use of social themes, and his intricate and precise dramaturgy and plot construction. At the same time, Ibsen is also considered old-fashioned, representing an aesthetic to be avoided in cinema, and a set of social themes belonging to a time long passed. Ibsen’s stage plays were thus widely understood paradoxically as a model for – and as the antithesis of – cinema’s assumed medium specificity. The film adaptations of A Doll’s House were produced at a moment in the reception of Ibsen (at the end of the “progressive era”) where the limitations of his “women’s plays” were being considered, not only by film critics (who, in the material I have studied, are predominantly male), discussing the various adaptations of the play, but also on a more general level in contemporary feminist debate. Along with arguing for Ibsen’s diminished relevance to discourses on the position of women and gender relations in early twentieth-century modernity, contemporary reviews emphasized the individual performances of the lead actresses in the films, and linked their diverging acting styles to specific cultural and national contexts and backgrounds. Perceived in individual rather than collective terms, and disassociated from inter- or transnational feminist issues, such readings of the characters and their gender relations seem to have diminished the political potential of the films. The American silent film adaptations of Ibsen were not only explicitly linked to the feminist movement, but also the possibilities for women of an independent economic and public life. For example, an unknown author writing in Photoplay magazine on the first American adaptation in 1917 starring Dorothy Phillips commented that “Ibsen is going around the camera field as he swept the women’s clubs twenty years ago.”  In a typical move, the upsurge of Ibsen adaptations in the 1910s is explicitly linked to a broader social context. Nora leaving her husband and children at the end of A Doll’s House has been described as signalling the advent of both the modern drama and the women’s movement. In the advertisements for all four of the now lost American adaptions there are recurring references to the famous actresses that had played the role of Nora in the theatre. Such references not only bolster the high art aura of the adaptations by referring to the legitimate stage, but also draw attention to theatre-specific practices of female entrepreneurship. The first English production of Hedda Gabler in 1891 was put on through the joint management of actresses Elizabeth Robins and Marion Lea after their propositions to stage the play had been rejected by several male actor-managers on the grounds of it being a “woman’s play”. Eleanora Duse, Italy’s first Nora, performed several Ibsen roles throughout Europe, and also established her own company, using a repertoire of Ibsen to introduce a different style of acting. Ibsen is thus specifically associated with the actress as manager or producer in the theatre of the late nineteenth century, a practice that challenged dominant structures to a large extent controlled by men. During the 1910s both psychological realism and the naturalistic acting style of the “new drama” influenced American cinema. However, Ben Brewster and Lea Jacobs have argued that the influence of naturalist acting techniques were not as pronounced as asserted in some studies, in particular with regards to the restraining of pictorial effects in silent film. They state: “Naturalist theatre was famously wordy, and to some extent the emphasis on the language compensated for the opacity of gesture and action typical of the acting style. It required considerable sophistication to adapt it to the new medium.”  The challenges of adapting Ibsen to the screen were referred to in a Moving Picture World review of A Doll’s House starring Dorothy Phillips. As the reviewer explains, “The absence of the theatrical in the Ibsen method and the difficulty of conveying the fine shades of meaning in the dialogue without the aid of speech render the task of the actors in the cast doubly hard.”  To portray Nora on the screen was understood as a demand that specifically tested the performance skills of the individual actress. In the 1911 Thanhouser film, the actress playing Nora is uncredited. As far as I know, she is still today unidentified. In the Morning Telegraph she is described as “the leading woman”, in the New York Dramatic Mirror simply as “the actress”. Reflecting the changing status of actors and stars in cinema during the first half of the 1910s, this anonymity is replaced by an emphasis of the name and personality of the lead actress in the subsequent three films that appeared a few years later. In discourses surrounding all these later films, the stage background of the lead actress is emphasized. This is particularly evident in the case of Nazimova, whose fame to a large degree was associated with interpreting Ibsen in both Russian and English. She had already enjoyed success as Nora on stage. Indeed, Nazimova formed her own production company in order to produce a film version of the play, 15 years after her first performance of the role in 1907. As I will discuss below, this distance of time was integral to the reception of her Ibsen adaptation. Rumours of a film version of the play starring Nazimova were reported in Moving Picture World as early as 1912. In fact, Nazimova appears as a reference in advertisements and reviews of all the three American film adaptations of A Doll’s House that were produced before her own effort. Even a review of the 1911 Thanhouser film mentions a theatre performance of the play starring the actress several years earlier. In a review of the 1918 film, it is stated that comparing Elsie Ferguson’s screen performance to the stage work of Nazimova “is to compare the beauty of white roses to those of a crimson hue. It is all a matter of taste.”  These floral metaphors, as well as the emphasis on taste in the description of performance styles, are significant. They suggest that many of the reviewers saw female beauty and star power in an individual sense. In this context, female agency in a collective or social sense was not a significant element of the reception of the films. What those next six months meant to Nazimova she alone must know. Trying to swallow the English language whole is a choking process, to say the very least of it – but to portray Ibsen characters as well! That took almost superhuman effort. Figure 4 - Publicity photo for A Doll’s House (Charles Bryant, 1922). The Margaret Herrick Library, Los Angeles. These descriptions of Nazimova and Ferguson are, to a large extent, preoccupied with narratives of transition: Nazimova’s conversion from Russia to the US and from stage to screen, and Ferguson’s leap from popular culture to serious drama. Similarly, reviews of the films produced in 1917, 1918, and 1922, are concerned with the performance styles of the leading actresses. They highlight how actresses physically embody Nora’s changes on film. In this context, the transition of Nora’s character becomes a recurring and discursive trope in film reviews. However, the cinema’s potential – particularly as a vocally ‘silent’ medium – for making the transformation of character visible rather than audible, through the physical body and gesture, seemed to accentuate the transitions of individual bodies. Rather than expressing political change on any collective level, performance was understood to be grounded in the individual performer, expressing different forms of femininity and proving the ability and power of the actress. Here, power can be understood both in terms of highlighting Nora’s strength and integrity, and in the sensory, aesthetic terms of the virtuoso acting performance. Most reviewers draw attention to Nora’s change from “girl” to “woman” and from complacency to agency. Reviewing the 1918 film starring Elsie Ferguson, Moving Picture World indicates the extent of this change, explaining how the “quick transition from the assumed character of the light-footed, smiling doll-wife without a care in the world to the woman enduring the strain of terrible fear makes heavy demands upon the dramatic ability of Miss Ferguson.”  In another review, Ferguson’s Nora is described as “the girlish and irresponsible wife who is entirely at sea as to what is right and wrong under man-made laws.”  Similarly, Nazimova’s Nora is described as a “restless, twittering girl-wife suddenly awakened to wisdom and maturity,”  and a “childish, but self-sacrificing and finally rebellious wife.”  Nazimova’s acting style is also compared to previous performances on stage and screen. Photoplay writes, for instance, that “The Russian star, usually eccentric, curbs her Camille tendencies, and as Nora, one of the drama’s most absorbing women, really acts. Or rather, thinks. At times she is over-expressive.”  Although Nazimova’s function as both producer and star of A Doll’s House (along with the increased emphasis on the ability of the individual performers in reviews and film discourse) can be seen as a continuation of the practice of the actress as entrepreneur already established with staging Ibsen, the descriptions of these efforts mostly remain detached from any implication of gender politics. However, as mentioned earlier, a critique of Ibsen is not only limited to the male-dominated reviews cited above but can also be found in the contemporary feminist discourse of the 1910s and 1920s. As recently pointed out by Penny Farfan, Elizabeth Robins – who produced and starred in several Ibsen plays in the 1890s – later joined the suffragette movement. Robins became a vocal first-wave feminist advocate. In 1928, Robins stated that Ibsen had represented an advance in the representation of women in the theatre and the art of acting. But he did not, according to Robins, have a similar political importance for feminism. In fact, Robins critiqued Ibsen for not reflecting the full range of women’s experiences, which could also involve activism and taking on a progressive and constructive political role. A similar criticism can be found in Virginia Woolf’s novel The Voyage Out (1915). Here, Ibsen provides heroic female role models for the lead character. However, at the same time (and frustratingly), he does not present any viable alternatives to established gender roles in society. 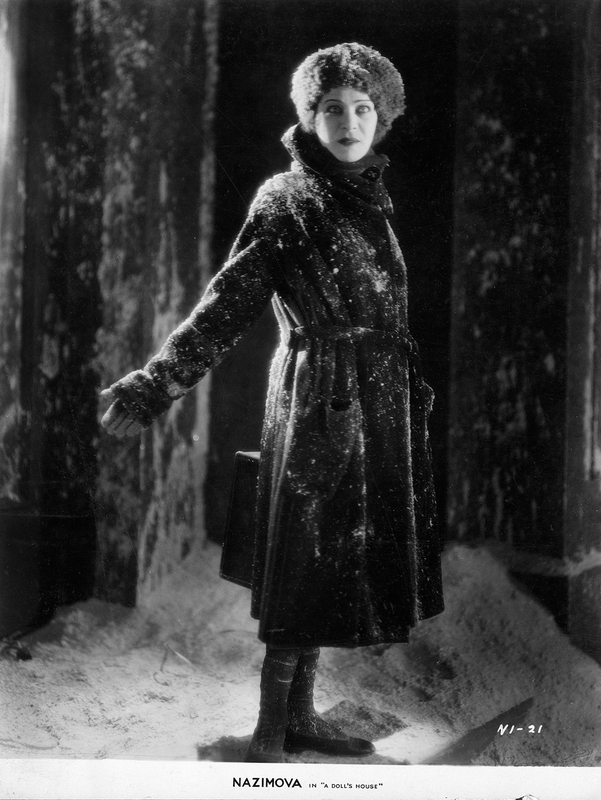 In the discursive surroundings of the four silent film adaptations, it is therefore perhaps not surprising that the performance of gender and the transition and maturity of Nora is understood exclusively on an individual level. Nora is a woman whose personal development is portrayed in a specific manner by a specific actress. She is not a figure who speaks of a collective transition from subjugation to power, modernity and equality. A Doll’s House starring Nazimova represents the last silent film adaptation of Ibsen in the US. Ibsen was not adapted to the screen again until 50 years later, during the period of the second-wave feminist movement. It’s instructive to compare the reception of the American silent cinema versions of Ibsen’s A Doll’s House to that of two English-language film adaptations of the play released in 1973, one directed by Joseph Losey and starring Jane Fonda, the other directed by Patrick Garland and starring Claire Bloom. In the reviews of the 1970s, the persistent relevance of the play to the present was often commented upon. Maybe the play’s theme of gender relations within a family was more fitting to the 1970s politics of the personal and the debates taking place in second-wave feminism. Alternately, perhaps the play in the 1910s and 1920s belonged to a past that was still was too recent. Taking this view, we might argue that without a necessary distance, films of A Doll’s House in the silent period were perceived as an uneasy mix of social realism and film d’art. Hence, although Ibsen is credited with laying much of the groundwork for several of the stylistic developments that cinema underwent during the silent period, his stage plays were not what cinema at the time was looking for. Likewise, as important a figure as he was to the early stages of the women’s movement and the position of female actresses at the turn of the century, his gender politics were not central to feminist discourse in the 1910s and early 1920s. An overview of films adapted from works by Henrik Ibsen, including the silent film adaptations of “A Doll’s House” discussed in this essay, is available in Karin Synnøve Hansen, ed., Henrik Ibsen, 1828-1992: En filmografi (Oslo: Norsk Filminstitutt, 1992). 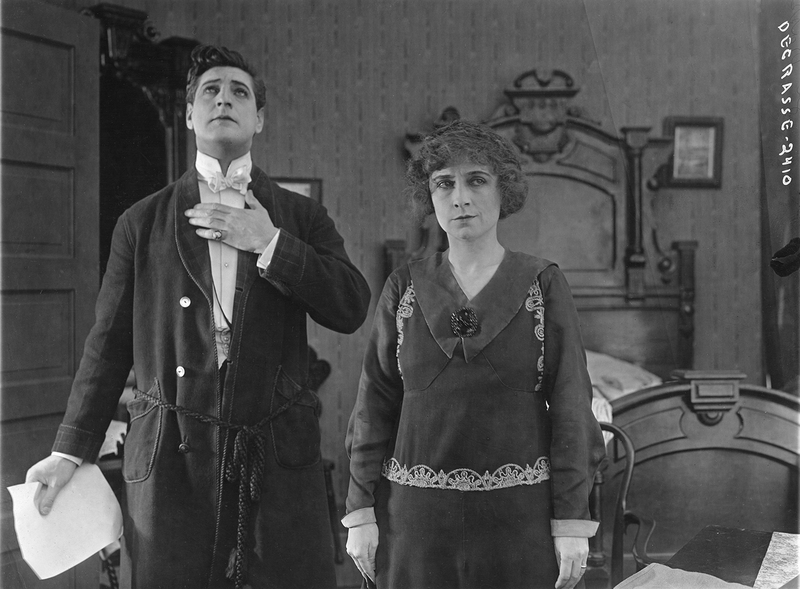 In addition to the four American adaptations, silent films based on the play were also produced in Russia (1917), Italy (1919), and Germany (1923).